What do you cook for a crowd of friends who are vegetarians and allergic to garlic? Lol. I wish that was a joke. Let me tell you, I had to search very long and hard to find a recipe that I thought was tasty enough to serve to this crowd. How about vegetarian chili? I find most vegetarian chilies tend to be bland. Meat is an essential source of flavor and if the meat is removed from the recipe it’s important to replace the flavor by some other means. I’m still on the hunt for the perfect vegetarian chili. How about fish? My vegetarian friends do eat fish but it can be very expensive and since I am cooking for seven people fish didn’t fit into my budget. Plus I’m pretty sure that I made fish last time they were over and I didn’t want to always feed them the same things. 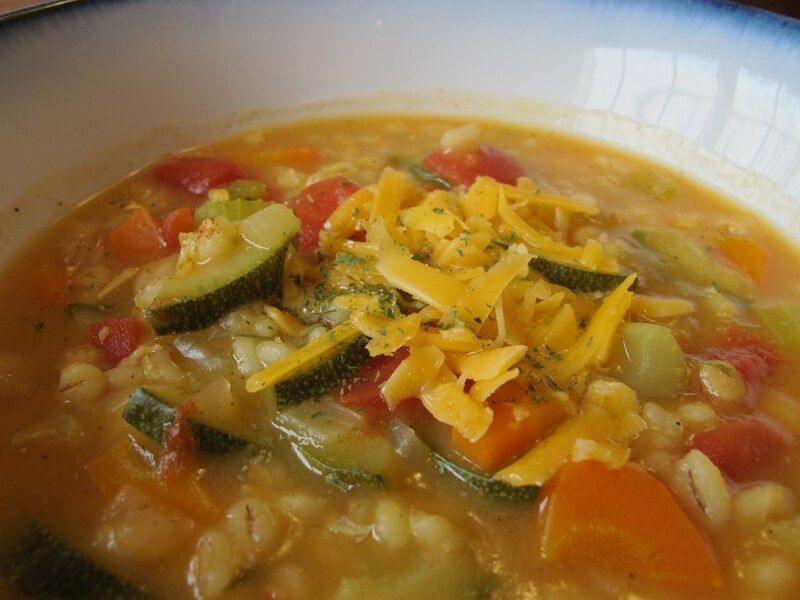 Then I miraculously found this vegetable barley soup recipe! Please don’t be scared by the number of ingredients. It’s important to me to cook using basic ingredients. All of the ingredients in this soup are common and you may in fact already have them in your pantry like I did. In a large pot, pour in the vegetable broth. 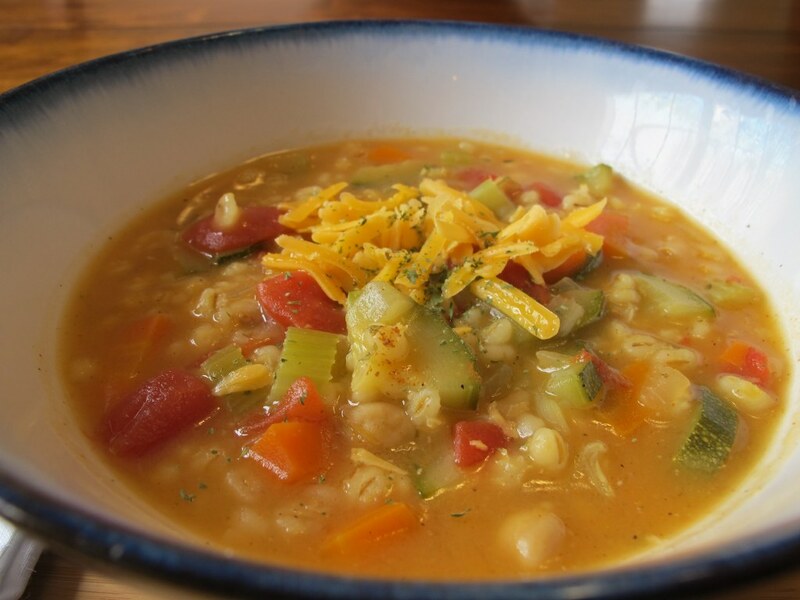 Add the barley, carrots, celery, can of diced tomatoes with juice, zucchini, can of garbanzo beans (drained), onion, and bay leaves. Season with garlic powder, sugar, salt, pepper, parsley, curry powder, paprika, and Worcestershire sauce. Bring to a boil, then cover and simmer over medium-low heat for 90 minutes. Store in an air tight container in the refridgerator. Or I like to freeze portions of the soup and reheat it during the weeknights and once reheated it tastes just as fresh as the day I made it. 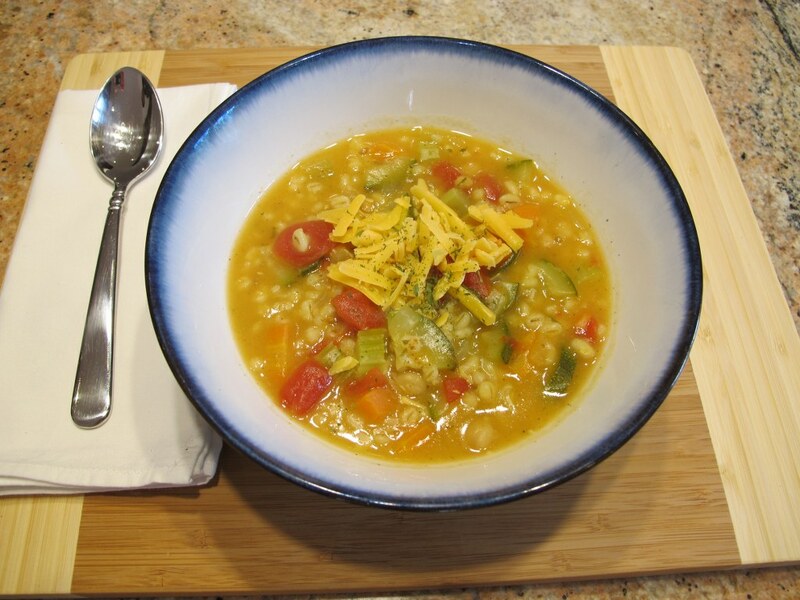 This soup is super duper simple and it’s hard to go wrong cooking it. 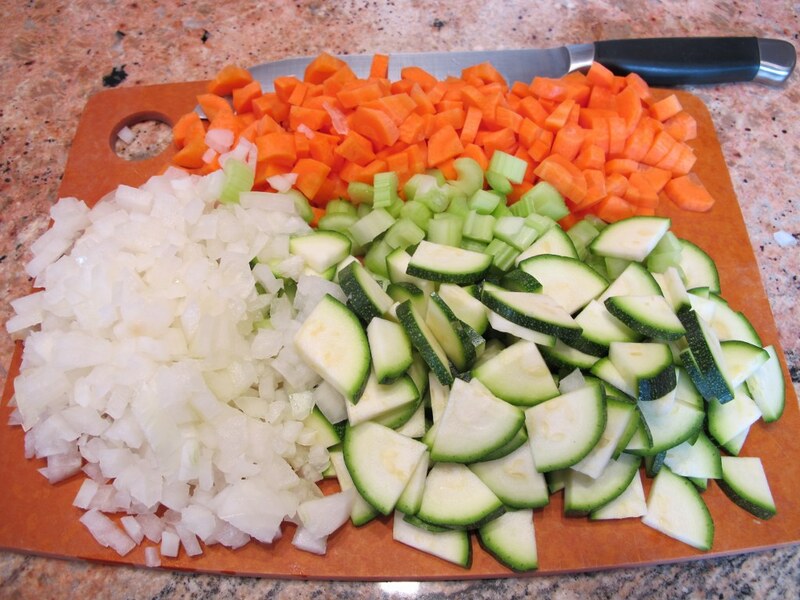 Cut the vegetables as big or small as you like. I like using low sodium vegetable broth but you can use any kind you want. If you prefer a saltier taste then by all means add a tad more salt or use regular sodium broth. I think the herb measurements are spot on. One of the best things I love about this soup is that it is seasoned well, not bland at all. You’ll note that there is garlic powder in the recipe. Previously I mentioned that my friend is allergic to garlic so I did omit that when I served the soup to my friends. With all the other great herbs, you don’t miss the garlic powder. However, my husband and I are garlic lovers so I always include the garlic powder when I make this soup for us. 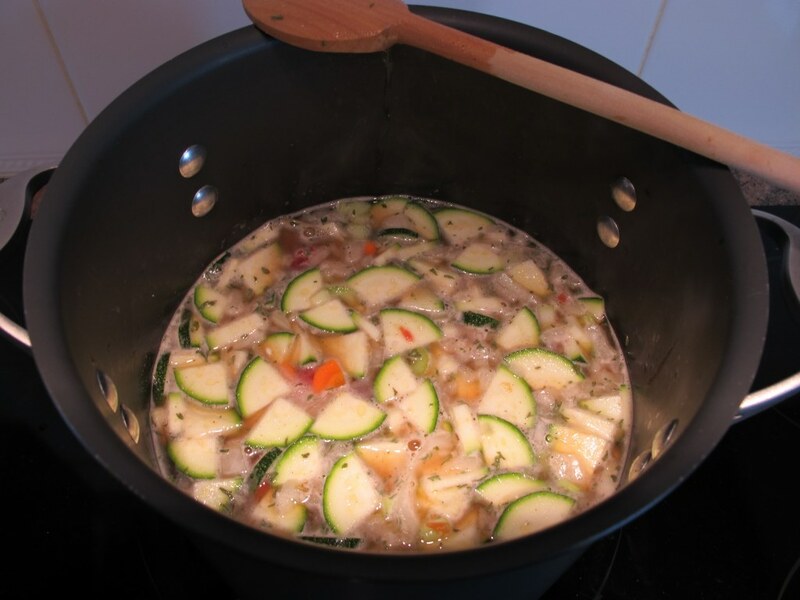 At the end of the 90 minute cooking time, I turn off the heat and let the soup rest for about 30 minutes before serving. I like my soups to have a “resting time” because it allows time for the soup to thicken a bit and for the seasoning to truly combine for maximum flavor. As a matter of fact, I think this soup tastes better the day after I’ve made it but that doesn’t stop me from eating it the day of because it’s still amazing! Mmmmm, healthy, tasty and filling! I am always looking for healthy and satisfying meals, especially because if you’ve seen some of my other recipes I go all out when it comes to my decadent desserts. I topped the soup with cheddar cheese and it goes lovely with corn bread, white bread or saltine crackers (which is my husband’s favorite). 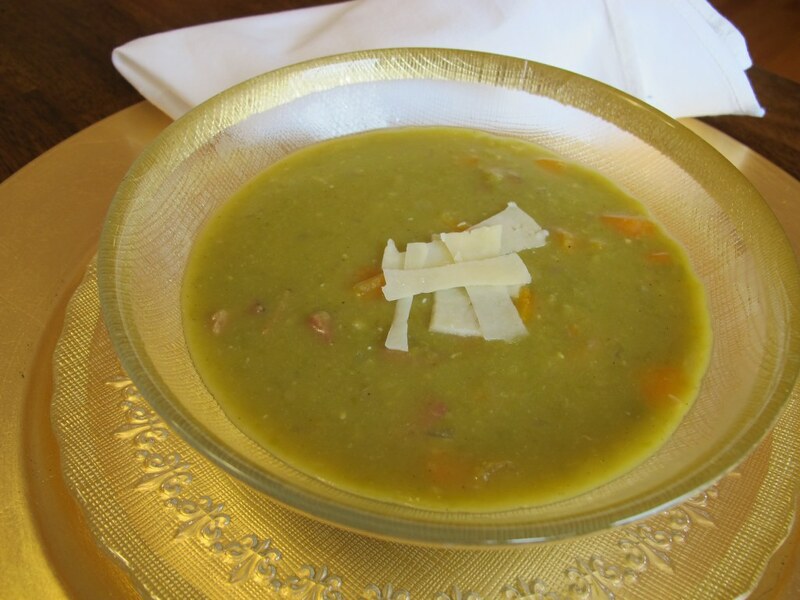 You may also like this Slow Cooker Split Pea Soup.